Enjoy with your family and friends the privacy of this beautiful villa. Relax sitting in the picturesque garden, on the covered terrace or watching the sunset on the balcony. Villa “The White House” is located in a quiet area, 300 m from the nearest beach. It consists of 2 units. On the ground floor there is a charming studio apartment suitable for 2 persons. 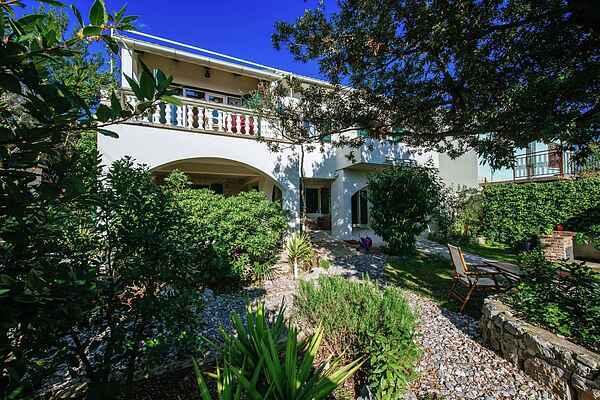 Carefully renovated in typical Dalmatian style it has a colourful bedroom, an open plan kitchen and a modern bathroom. The first floor apartment can accommodate up to 5 persons. The uniquely furnished living room is decorated with love. From there you have direct access to the balcony with a nice view. There are 2 comfortable bedrooms, a modern bathroom, a separate toilet and a fully equipped kitchen. The house is easily reachable by plane and by car. Sukošan, a little town near Zadar, provides everything you need. There is a wide range of restaurants serving international and traditional Dalmatian food. You can choose among different beaches, the nearest one is 300 m away. Marina Dalmacija, the largest on the Adriatic coast is located only 300 m from the house and offers nightlife with restaurants, bars and various summer events. Zadar, the European top destination 2016, is reachable in 15 minutes by car. With 1 hour driving you can visit three national parks: National Park Krka, National Park Paklenica in the Velebit mountain and National Park Kornati, a true sailing paradise. I am a German who came to Croatia 20 years ago for work and have never left it since . My wife Ines is from Zadar and knows every stone in this area. We bought our house in Sukošan because we love this part of Dalmatia: here you have this wonderful combination of the sea and the mountains; three national parks are within reach of one hour’s drive. We want you to enjoy our house as much as we do and we want to help you to discover this beautiful nature around. Welcome to “The White House”!